My husband and I have lived in Maine all of our lives. We settled into Lyman and started a family in the late 80's. 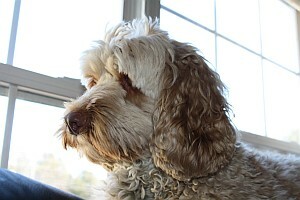 That family now consists of 4 human kids (2 are at home now) and lots of Doodle children. Our home sits on 6 acres with lots of room for everyone to run and play during the day and enough bedrooms for each child to cuddle up at night with a Doodle of their choosing and for the mommas to have 2 delivery rooms. Let me tell you how we became proud Doodle owners. We lost our Black Lab in 1995 and I decided I would not add a dog to our family again until I could stay home and raise it. So as time went on we started to long for a puppy in our home. My oldest son and I have allergies, so we needed to find a family friendly, as well as allergy friendly dog. I went on the net and filled out a form that helped picked the perfect dog for you. 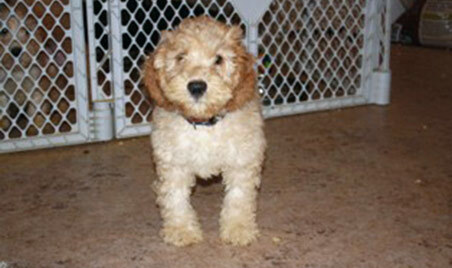 Some of the breeds that came up were not at all what we wanted. The one we thought we wanted ended up not being the right fit for our family after I met one in person. 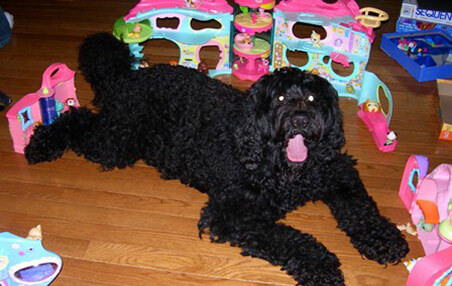 The only other type of dog that struck my curiosity was the Labradoodle. 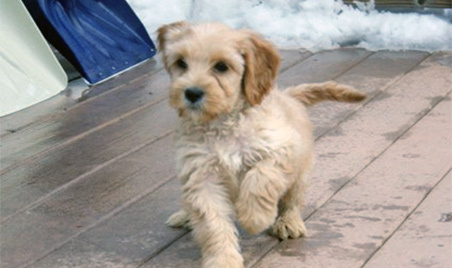 Now in 2001 I had never heard of a Labradoodle. 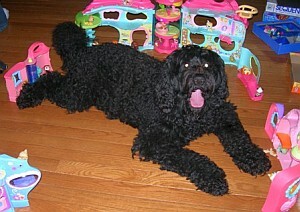 Well to get to the point we adopted a female (Sierra) early in 2002. We picked her up at Portland Jetport and it was love at first sight. Sierra was everything we could have ever wanted in a new family member. We soon added two more to our home. 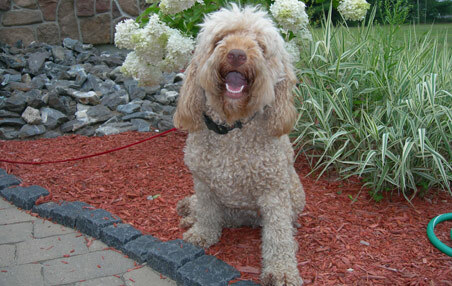 We love the Labradoodle and over the years have really learned how wonderful this breed truly is. 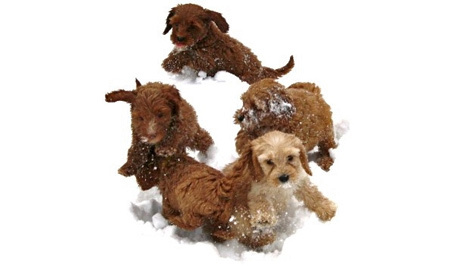 They are smart, intuitive, loving, gentle, funny and just plan amazing family dogs. When given the right love and time these dog will be more then you ever imagined a dog could be. 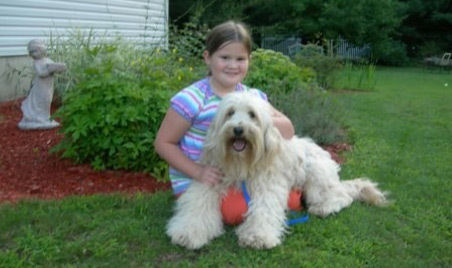 My goal here at Southern Maine Labradoodles is to provide families the healthiest most well rounded pups I can. 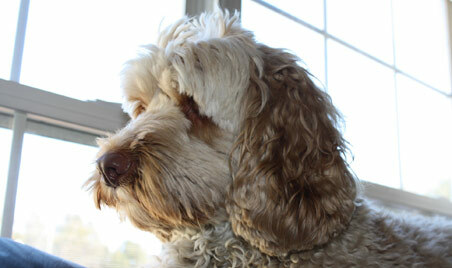 I stand behind my dogs and have been since the first litter arrived on March 3rd of 2004. I am here for the families whenever they have a question or concern. I still get visits and cards from families that adopted from my very first litter. I strive to have great relationships with the families so they always feel comfortable to call or email me anytime. Our dogs are part of our family and every pup that goes home always will be too. Those pups will always be important to us, as will their new families. Thank you for reading about my family and our goals. I look forward to talking with you.